So say researchers at Cambridge. If you're looking to excuse yourself for downing a few too many glasses of wine last night, a new study suggests you can blame the glass itself. In the report, published in BMC Public Health, researchers found that in bars and restaurants, larger glassware led to more wine ordered. 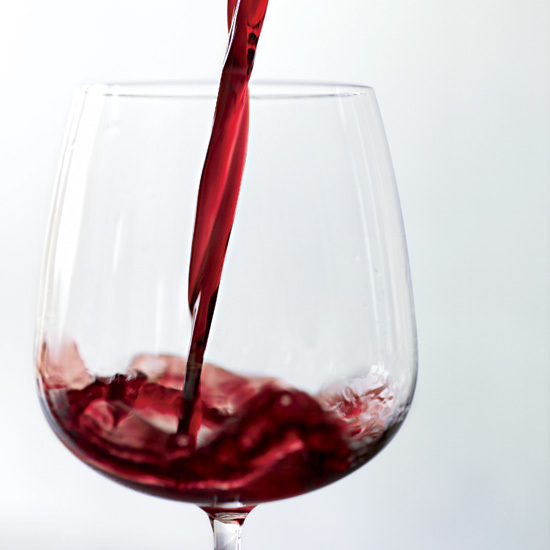 Though the amount of wine in the glass remained consistent, consumers given the larger glass tended to order more rounds of vino than those given standard or small-sized glassware. Researchers tracked wine purchases at bars and restaurants over the course of 16 weeks, utilizing different sizes of wine glass to serve the same amount (5.9 ounces) of wine. The glasses came in three sizes: small (8.4 ounce), standard (10.1 ounce), and large (12.5 ounce). They concluded that when a bar switched to using the large wine glasses, there was a 9.4 percent increase in wine sales, while sales stayed the same with standard and small-sized glasses. "Larger glasses change our perceptions of the amount of wine, leading us to drink faster and order more," lead study author Rachel Pechey says of the possible reason for the uptick in sales. However, Pechey, a public health research associate at the University of Cambridge, noted that researchers found it odd the smaller glasses didn't have a decreasing effect on sales. This study goes hand-in-hand with past research that has shown diners eat less when given smaller plates, due to the perception that there is more food present. While Pechey and her team are hoping their research might result in new laws could be placed on glassware sizes to discourage excessive drinking, most advantageous bars and restaurants will see it as an opportunity to break out the big glasses and rake in the big bucks.